Blue spectrum light from electronics suppresses melatonin for several hours after use (1,2) and disrupts your circadian (sleep wake cycle) clock (3). This impacts sleep quality and daytime tiredness (4). Sleep disruption can also impact anxiety, depression, and many other health conditions (5). So it may be worth avoiding use of electronic devices such as computer, tv, tablets, smartphones, etc. 1-3 hours before bedtime. Some suggest replacing exposure to bright light bulbs with dim light bulbs around bedtime (6) may also be helpful. There are even light bulbs that do not emit blue light. What if I need to use electronics at bedtime? Sometimes it may be necessary to be on the computer, tv, smartphone, etc right before bedtime. Blue blockers may help prevent sleep disruption from electronics. They block blue light emitted by electronic devices, thus melatonin is not disrupted (6). What are some examples of blue light blockers? Some examples include blue blocker eye glasses, software programs that prevent your device from emitting blue light, plastic filter screens that are placed on top of the screens to block blue light, and light bulbs that do not emit blue light. You can search for “blue light blockers” “blue light filters”, “bedtime reading software” etc. in a search engine, or in an app store. There are small studies that show blue blockers work to prevent melatonin disruption and improve quality of sleep and mood. For example, 20 subjects were randomized to use either blue blocking glasses, or non blue blocking glasses 3 hours before bedtime over a 2 weeks period (7). Those who used blue-blocking glasses reported better sleep quality and mood. • You still need to be mindful of getting enough hours of sleep—getting 4 or 5 hours of quality sleep when you need 8 will still leave you tired. • Blue blocking methods may not help with your sleep if your device usage is overly entertaining or emotionally intense. • You still need to address other causes such as use of caffeine, nicotine, alcohol use, etc. • This is still a relatively new terrain and further research is needed. Are you sleeping poorly? Are you tired during the day? Are electronic devices interfering with your sleep; can you cut down your usage before bedtime? Can blue blockers help you? What are other ways to improve sleep? National sleep foundation sleep tips. 1. Brainard GC, Hanifin JP, Greeson JM, Byrne B, Glickman G, Gerner E, et al. Physiol 2001;535(Pt 1):261–7 [August 15, PMID: 11507175]. 4. Fossum IN, et al. The Association Between Use of Electronic Media in Bed Before Going to Sleep and Insomnia Symptoms, Daytime Sleepiness, Morningness, and Chronotype. Behavioral Sleep Medicine. Volume 12, Issue 5, 2014, pages 343- 357. Published online: 14 Jul 2014. DOI: 10.1080/15402002.2013.819468. 6. Kayumov L, et al. Blocking Low-Wavelength Light Prevents Nocturnal Melatonin Suppression with No Adverse Effect on Performance during Simulated Shift Work. The Journal of Clinical Endocrinology & Metabolism 90(5):2755–2761. 7. Burkhart K1, Phelps JR. Amber lenses to block blue light and improve sleep: a randomized trial. Chronobiol Int. 2009 Dec;26(8):1602-12. doi: 10.3109/07420520903523719. Smartphone or cellphones are a useful tool and when used properly can have many benefits. Many students frequently use cell-phones and often very close to bedtime. Students may not know that cellphone use might impact their ability to sleep at night and this might impact their daytime energy levels. This study explored the relationship between cellphone use at bedtime and sleep. 532 students aged 18–39 were recruited from lectures or via e-mail (1). Mean time of media use per night was 46.6 minutes. Mobile phone usage for playing/surfing/texting was positively associated with insomnia. Computer usage for playing/surfing/reading was positively associated with insomnia. Computer or cellphone use in bed before bedtime may worsen your sleep. How does screen time impact sleep? Media use might make it take longer to fall asleep (2). Media use might mean less time spent sleeping, thus reducing sleep (3). Bright light emitted by electronic devices might impact sleep quality (4). Light exposure might be temporarily activating you (5-6). Are you sleeping poorly? Are you tired during the day? Is screen time before bed impacting your sleep? Will cutting down on screen time improve your sleep? How do you know? 1. Fossum IN, et al. The Association Between Use of Electronic Media in Bed Before Going to Sleep and Insomnia Symptoms, Daytime Sleepiness, Morningness, and Chronotype. Behavioral Sleep Medicine. Volume 12, Issue 5, 2014, pages 343- 357. Published online: 14 Jul 2014. DOI: 10.1080/15402002.2013.819468. 2. Higuchi, S., Motohashi, Y., Liu, Y., & Maeda, A. (2005). Effects of playing a computer game using a bright display on presleep physiological variables, sleep latency, slow wave sleep and REM sleep. Journal of Sleep Research, 14, 267–273. 3. Van den Bulck, J. (2004). Television viewing, computer game playing, and Internet use and self-reported time to bed and time out of bed in secondary-school children. Sleep, 27, 101–104. 4. Cain, N., & Gradisar, M. (2010). Electronic media use and sleep in school-aged children and adolescents: A review. Sleep Medicine, 11, 735–742. 5. Cajochen, C., et al. (2011). 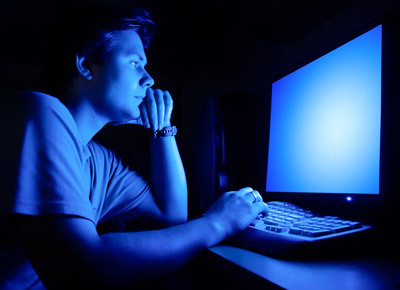 Evening exposure to a light-emitting diodes (LED)-backlit computer screen affects circadian physiology and cognitive performance. Journal of Applied Physiology, 110, 1432–1438. 6. Campbell, S. S., et al. (1995). Light treatment for sleep disorders: Consensus report. III. Alerting and activating effects. Journal of Biological Rhythms, 10, 129–132.